For the last 25 years, in order to facilitate U.S. access to foreign capital, the United States Congress has allowed U.S. issuers to sell “bearer” bonds to non-U.S. investors. “TEFRA D,” one of the tax regulations that defines how this is done, has become a common term in the world’s capital markets. Now, tax writers in the U.S. Congress propose a complete reversal of these rules. 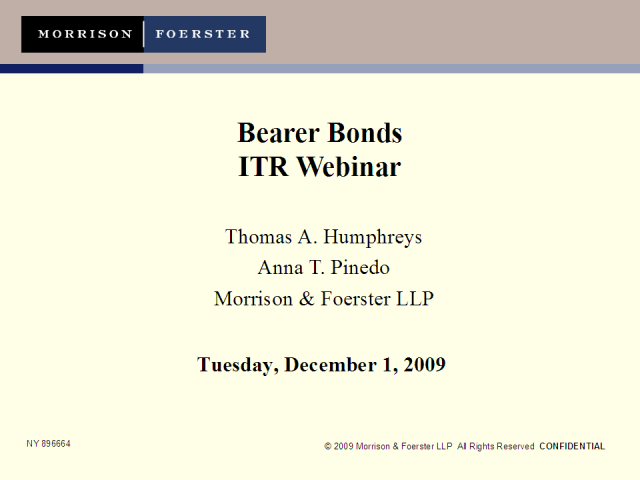 The Foreign Account Tax Compliance Act of 2009, recently introduced by Senator Max Baucus (D-Montana) and Representative Charles Rangel (D-New York), chairmen of the Congressional tax writing committees, would repeal the U.S. bearer bond exception and require that U.S. issuers sell all of their debt in registered form. The proposed change could also affect foreign issuers that, to date, have in many cases issued their bonds (even those sold to foreign investors) in compliance with TEFRA D. This proposal is forcing issuers with Euro MTN programs or other active issuance programs to start thinking about their documentation and future funding alternatives.